All clients can be found at http://nxtclients.org. Mentioned Nxt features are explained in Nxt Wiki. Read the full version of Damelon and Salsacz’s PRESS RELEASE here. Solaris is a full featured NXT client for Windows. As well as the usual Nxt features, including Asset Exchange, Solaris boasts several features that are not native to Nxt, such as marked information, monitoring and an address book, as well as support for multiple accounts. The installation process is simple, and the user can choose between open or closed source versions. The source code was released on February 16, 2014. 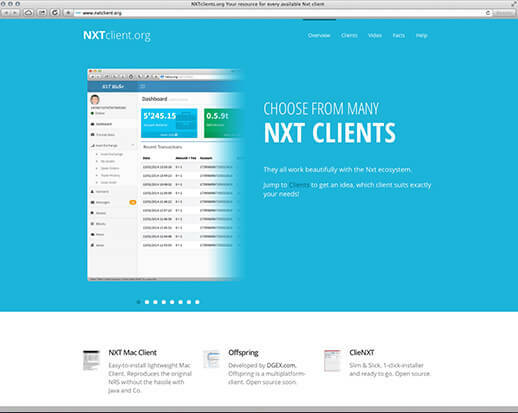 ClieNXT is a simple open­source client written in Java, as is the native Nxt client, NRS. The current version (0.0.4) has one­click install and autoupdate ability as well as all of the basic Nxt functionality. One additional feature us the ability to send multiple transactions or messages using Nxts AM system. DotNxt was announced on the 14th January 2014 as an entrant in the Nxt client competition and was released on the 18th of the same month. Source code was released on the 1st February. DotNxt aims to be a simple and accessible easy install client with a clean interface and simple design values. It supports all current features, and is built using Microsoft .Net Framework 4.0. Right now Offspring supports basic NXT features: Sending money, assigning aliases and creating tokens. It also includes real time BTC / NXT market rate. Among planned features are: Multicurrency client,; asset exchange; full block explorer; encrypted p2p messaging and transaction memos. Offspring stoers NXT private keys (passphrase) together with Offspring account label in an encrypted file. While other clients still use “brainwallet”, this now provides wallet files known from Bitcoin wallets. NXT Wallet is a web client with many features including Asset Exchange. It is currently connected to Testnet which is a test version of NXT network used by developers. It provides Contacts, Messages, Aliases and even Polls and a list of News. So you can read news from the Nxt forums, blogs, or social sites straight from the web client. It will be packaged as a downloadable program for Windows, Linux and Mac. This is not classical client for average users, but a valuable complement to the other clients: It is a powerful tool for developers, with focus on the Asset Exchange system. It is a fully open sourced python implementation for api communication. Program can be extended by anybody easily by modifying existing stuff in there. Nxs, pronounced “Nexus”, is a modified version of the default NRS web client that includes many new features and a more modern design. It allows to set a language or to show QR code of the current unlocked account. It includes new secret phrases generator. Users can also use up to 100 predefined sippers to obscure their secret phrase from dictionary words. Its source was released February 18.